There is a stretch of highway along the eastern side of Maui that’s hailed as the most picturesque in all of Hawaii, and some say it rivals the most beautiful stretches of coastal land in the world. The famed Road to Hana, also known as the Hana Highway or the Hana Millennium Legacy Trail is a 45 mile stretch of road that meanders its way through more than 600 winding curves, crosses 59 historic bridges, and treats you to panoramic views of the Pacific, cascading waterfalls, lush tropical rainforest, deep gorges, hiking trails, and freshwater pools. 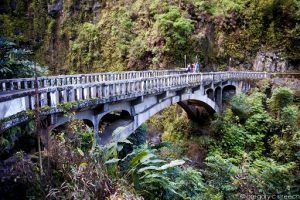 For many, the majestic “Road to Hana” is the highlight of their Hawaii vacation. The route has been listed on the National Register of Historic Places due to the history behind its construction. Originally a foot path known as the King’s Road, the original walkway was established by Chief Pi’ilani who ruled the area in the 1400’s. As the years progressed and the sugar and pineapple industries began to grow, the path was widened and further developed with the construction of the bridges commencing in the early 1900’s. All but one of these original bridges have been maintained and add to the aesthetic appeal of the iconic highway. As many will tell you, the “Road to Hana” is not about the destination, it’s about the journey. The route is the only thing connecting the small town of Hana to central Maui and because of this, Hana has been able to maintain its distinctly Hawaiian culture and charm. While this is a lovely end to the journey, it is all of the natural beauty you’ll witness along the way that makes this drive so special. Hawaii’s Hana Highway begins in the town of Paia. It is recommended that you get an early start as driving the Road to Hana is an all day event. Since most of the bridges are one lane, and the road incorporates so many turns, driving fast isn’t an option. A one way trip can take 2 – 3 hours without stops – but trust us, you’ll want to stop. With so many look-outs, lush valleys, waterfalls and pools, the route is a photographers dream. Water lovers will want to pack a swimsuit to take advantage of the numerous swimming areas and beaches along the way. It’s important to fill your gas tank before you leaving Paia town as there are no stations again until you reach Hana. Most people pack a cooler with snacks in order to enjoy lunch while taking in the scenery at one of several pull over areas, but there are several fruit and food stands along the trail if you’d prefer. 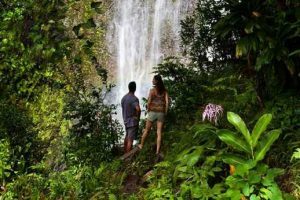 Some of the route’s highlights include Keanae Point, Wailua Falls, the Bamboo Forest on the Pipiwai Trail, as well as the Garden of Eden and Botanical Arboretum. There are also some incredible state parks along the route with fantastic vistas. The Waianapanapa Park is home to one of Hawaii’s most spectacular black sand beaches. There are several guide books available which detail the must-see stops along the way. Some of the past guests staying in our Maui vacation rental properties have chosen to spend the night in Hana and embark upon the return drive the following day as this has allowed them to take in sites they skipped on the drive in. For those who’d prefer to let someone else to the driving, guided tours are also available. 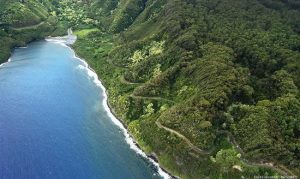 If you are staying in one of our luxury vacation properties in Hawaii and would like to learn more about the beautiful Road to Hana, our concierge is on-hand and happy to help! We wish you an Aloha filled day, and hope to see you in Hawaii soon!